The leaders of South Korea, China and Japan on Wednesday adopted a special statement, welcoming the fact that the two Koreas affirmed the goal of denuclearization and expressing their active support for the outcome of the inter-Korean summit. They officially declared a "new era of Northeast Asia", which seeks to expand the countries' practical cooperation in the fields of economy, environment and health. They also agreed to hold trilateral summits on a regular basis so the three countries can cooperate more effectively and steadily. 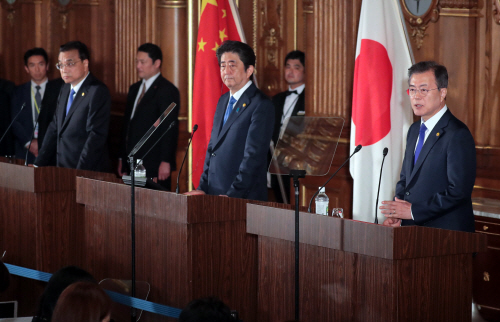 President Moon Jae-in, Japanese Prime Minister Shinzo Abe and Chinese Premier Li Keqiang held the 7th South Korea-China-Japan summit in Tokyo on Wednesday. The leaders of the three countries shared their opinions on the regional and international affairs as well as ways to promote substantial cooperation between the three countries. In particular, President Moon shared to the leaders of Japan and China the outcome of the inter-Korean summit that adopted the Panmunjom Declaration, which contains practical measures for complete denuclearization, establishment of permanent peace and improvements in South-North Korea relations. In the meantime, Moon affirmed that South Korea will actively communicate and cooperate with China and Japan in order to create a new history of peace and prosperity on the Korean Peninsula, Northeast Asia, and the world through successful North Korea-US summit and dialogue between North Korea and the international community. In response, Abe and Li welcomed the successful outcome of the inter-Korean summit while expressing their strong commitment to constructively contribute to the peace and stability of the Korean Peninsula. Above all, the three leaders adopted a special statement on the South-North Korea summit, supporting the Panmunjom Declaration. In the special statement, the leaders welcome the fact the two Koreas affirmed the goal of complete denuclearization, express hope for the success of the North Korea-US summit and express their stance to continue the joint efforts of the three countries so the inter-Korean summit will contribute to the peace and stability in Northeast Asia. Since the special statement is the first international demonstration of support after the Panmunjom Declaration, it is likely to have a positive impact on the North Korea-US summit, where practical measures for denuclearization will be discussed in detail. Furthermore, it is expected that both China and Japan will support the will of President Moon and North Korean leader Kim Jong-un to denuclearize the Korean Peninsula. At the meeting, the three leaders agreed to jointly work to address environmental problems, including fine dust, health and aging policies as well as liquefied natural gas (LNG) and information communication technology (ICT) issues. They also agreed to work to increase the number of visitors among the three countries to 30 million by 2020, and expand the role of the Trilateral Cooperation Secretariat (TCS) to hold trilateral summits on a regular basis. In a joint press conference after the summit, Moon said, "If South Korea, China and Japan work together, I am convinced that they will be able to begin a new era of peace and prosperity on the Korean Peninsula and in Northeast Asia."